God is my portion, and my cup: Come, Come To Jesus, Who Is Our Loving And Compassionate Savior! Come, Come To Jesus, Who Is Our Loving And Compassionate Savior! 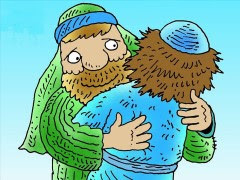 John the Baptist was in the wilderness, and people from Jerusalem and from all of Judea and all over the Jordan Valley went out to see and hear John. And when they confessed their sins, he baptized them in the Jordan River. 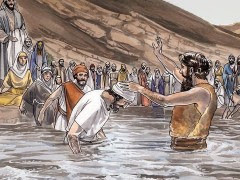 John openly proclaimed, “I baptize with water those who repent of their sins and turn to God. But someone is coming soon who is greater than I am—so much greater that I’m not worthy even to be his slave and carry his sandals. He will baptize you with the Holy Spirit and with fire. He is ready to separate the chaff from the wheat with his winnowing fork. Then he will clean up the threshing area, gathering the wheat into his barn but burning the chaff with never-ending fire.” John prepared the heart of the people for the Messiah, Jesus Christ, our Savior. God, the Father, was truly pleased with Jesus, and the Holy Spirit descended on Jesus. Thus, the Father, the Son and the Holy Spirit were at one place, and the God was truly pleased. The ministry on earth for Jesus Christ, the Son of God was being prepared. The ministry of Jesus was for us, the children of God. The Trinity (Father, Son, and Holy Spirit) was one place in great joy, which was again for us. It was the greatest blessings to all mankind. 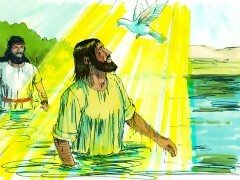 Jesus fully experienced the blessing and joy of the baptism with John and people followed John. John and the people around Jesus being baptized were together in great joy also, hearing the voice from heaven, “This is my dearly loved Son, and whom bring me great joy.” Hearing the voice of heaven alone was their great joy, which could not be found from anywhere else on earth. The tremendous blessing was with John and the people watching Jesus being baptized, and also for us too. The joy among the people, John and Jesus did not last. 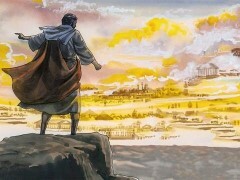 Soon Jesus was led by the Spirit into the wilderness. Jesus was about to go through the physical hardship and the torture of His spirit. Although Jesus was fully God and man, He had to endure to the very limit as a human being. First, he fasted for forty days and forty nights. He was very hungry. In fact, he was at a brink of his physical body’s death. He was completely drained out, as Apostle Paul said, “I am being poured out like a drink offering on the sacrifice and service coming from your faith” (Philippians 2:17a). However, it was for us, whom He loved most. Apostle Paul continued, “I am glad and rejoice with all of you.” (Philippians 2:17b). Jesus did with joy for all of us. It was the just beginning though. When Jesus was completely drained out physically and mentally, the devil came and tempted Jesus. 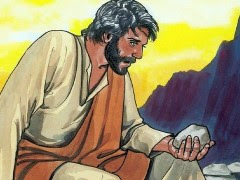 The devil said, “If you are the Son of God, tell these stones to become loaves of bread.” The devil first attacked the basic necessity of the body of Jesus after forty days and nights of fasting. However, Jesus did not give in. Why? For us. Jesus overcame the temptation with the Scriptures, i.e., the Word of God. The devil failed. The love of Jesus for us was much stronger than the extreme desire of food after forty days and nights of fasting. Have we love anyone more than such an extreme desire of food after forty days of fasting? The devil defeated again. We are often getting a temptation to apply God’s Word in our lives wrongly for our own gain. The devil’s temptation was not unique to Jesus, but very common among us, all believers. What’s the best way to overcome such a temptation? As Jesus did, use the Scriptures accordingly God’s truly intention in the context of the Bible that God wants for us to live in Him. Using a Bible verse out of context for our own earthly gain is a telltale sign of our wrong application of the Scriptures, the Word of God. Whenever we apply God’s Word to our lives, we carefully read the God’s word in the context of God’s desire – saving us from our sins and transgressions and transforming us as His children, who are holy (being set apart [from the world]) and blameless. The temptation of trying to be the first and getting the glory of the world is so fundamental to all human beings on earth by equally sharing in their hearts. Therefore, the force of this temptation is deadly. Once being trapped into this temptation, nobody gets out by his/her own strength. Jesus defeated all three deadly temptations that any human beings easily get trapped while living on earth. Jesus also showed how to defeat the temptations. The answer was the Scriptures, God’s Word. We want to ask again why. Why did Jesus take such temptations at the extreme degrees? The answer is love. Jesus loved us, and Jesus experienced our pains, hardships and temptations as we take on earth to the extreme degrees. Thus, we know that Jesus truly emphasize our pain, hardships and temptations on earth to be called as our true Friend and Savior. Repenting sins is the first step to come to God. The sins are barriers between us and God. This is so fundamental and absolutely needed for all believers, i.e., us. However, it is most easily overlooked in our prayers and Christian lives. 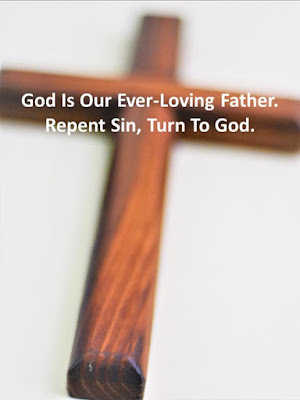 When was the time that we truly repent our sins before God in our prayers? Are we truly repenting our sins before God daily or even every moment that we sin? How many prayers are spoken or given to God without repenting our sins? Our true and authentic repentance before God is the power of our faith and makes our inner persons healthy and stronger. If we want to go into a deeper relationship with God, Our Ever-Loving Father day by day or even moment, the we confess out sins by telling to God and humbly asking for His forgiveness. The second step is to turn to God. Adam and Eve hid from God, when God called them. Their sins made them turn away from God, i.e., running away from God. As God was approaching to them, they were even more making a distance from God. Why? Their sin was in the way between God and them. They used to enjoy the presence of God, but after sinning, the relationship was completely changed. The loving God was turned into the fearful God. Sins are this much terrible by transforming our Loving God to the fearful God. Although we want to turn to God, we cannot. The gracious and merciful God always forgives our sins. He always wants to restores our loving relationship with Him. Please see His open arm, and turn to Him as a child runs into its loving father. God is love. When we empty our hearts by confessing our sins of the worldly desires and glory, we can see our loving God who is waiting for us. Then turn to God. Surely God accepts us with His loving open arms. God knows our pains, struggles, hardships, and temptations because Jesus, although He is the Son of God, experienced all to the limit that any of us could not endure. Thus, we have a confidence to approach Him, who is truly compassionate and infinitely good to us. Praise God, who send His only begotten Son, Jesus Christ for us!